Kim Il Sung University, North Korea’s most prestigious seat of higher learning, has become the first university in the country to launch a website on the global Internet. The site is available in Korean and English and is being served from a computer in Pyongyang. It joins a handful of other websites that are run by the North Korean government and accessible from outside of the country. There’s much of what you would expect on a university website: a history, areas of study, an outline of some of the research being carried out, the university’s buildings and foreign exchange programs. One thing you won’t find, at least in English, is much information on current research, personal sites of students or schools at the university, or even contact details. North Korea has slowly been expanding the number of websites accessible from the global Internet since the Korean Central News Agency went online in 2010. A larger number of sites are thought to be available on a domestic intranet — and Internet-like network that is only available within the country and does not connect to international sites. 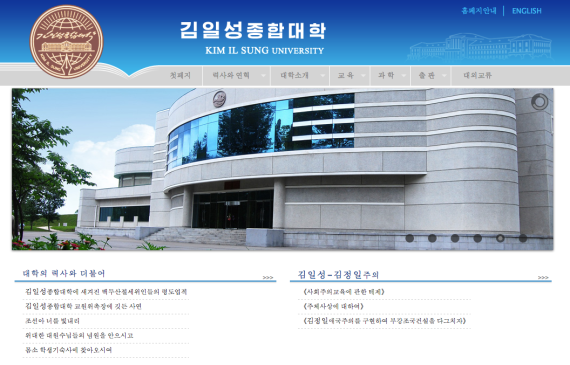 1 Comment on "Kim Il Sung University opens website"